The Department of History is requesting $12,085 ($14,085 less a $2,000 cost share from the UCF Libraries) to purchase Gale Indigenous Peoples: North America from Readex, Gale, part of Cengage Learning. Gale, part of Cengage Learning, is a world leader in e-research and educational publishing for libraries, schools and businesses. Best known for accurate and authoritative reference content as well as intelligent organization of full-text magazine and newspaper articles, Gale publishes learning resources in a variety of formats including web portals, digital archives, print and eBooks. 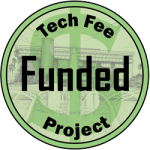 In consultation and collaboration with several academic departments and the UCF Libraries, The Department of History is asking the Technology Fee Committee to approve the purchase of Gale Indigenous Peoples: North America. Enabling exploration of the political, social, and cultural history of Native Peoples from the 16th century well into the 20th century, Indigenous Peoples: North America illustrates the fabric of the North American story with unprecedented depth and breadth. Comprehensive yet personal, the collection covers the history of American Indian tribes and supporting organizations meeting a need for historical researchers. Indigenous Peoples: North America will provide a robust, diverse, and appealing search experience and enable intelligent inquiry into the culture and heritage of indigenous people. Includes manuscript collections, rare books and monographs, newspapers, periodicals, census records, legal documents, maps, drawings and sketches, oral histories, and photos. Features video content from the Bureau of Indian Affairs. Materials have been sourced from both American and Canadian institutions. Major partners include the National Archives, Library of Congress, Princeton University, University of Alberta, Moravian Archives, Gonzaga University, and more. Supports research in ethnology, sociology, literature, anthropology, linguistics, political science, among other subjects. Cross-searchable with Gale’s other leading collections within Gale Artemis. Gale Indigenous Peoples: North America is delivered online and available 24 x 7. The collections will be accessible to all students on campus or off campus through Shibboleth authentication. One hundred percent of UCF students and faculty could have simultaneous access to these outstanding resources. There are no limits to the number of users who can access the content at a given time. Given the many subject areas covered within these primary source databases many UCF students and faculty will use the content for research and educational purposes. A minimum of 5,744 students will directly benefit from content because their major or minor is focused in areas including language and literature, political science, history, anthropology and sociology. UCF students and faculty will also find this content searchable in Gale Artemis: Primary Sources. This search tool can be found by searching the A-Z Datbase list on the library homepage. Because UCF is a valued customer of Gale, this new search interface was provided at no cost. UCF already has access to three major resources that make up the heart Gale Artemis content. Gale Artemisis a groundbreaking research environment that integrates formerly disparate digital collections to enable innovative research. Gale Artemis provides an unprecedented, seamless research experience that helps students find a starting point, search across a wide array of materials and points in time, and discover new ways to analyze information. in comparative government analyzes or Women’s Studies scholars interested in gender divisions and hierarchies amongst indigenous peoples. Footage of late twentieth century Native American counterculture and self-determination activism can provide much research fodder for students studying non-profit organizations, mass media, capitalism, and ethnic relationships. In addition, this database will provide numerous instructors at UCF with additional materials on which to base student class projects and new course development. Having ongoing access to the resources in this collection specifically will benefit faculty teaching courses affiliated with the existing interdisciplinary North American Indian Studies minor, a minor that involves various departments and offers courses ranging from North American Indian history (AMH) to Ethnology of North American Indians (ANT) to Indigenous Politics and the Environment (CPO). The documents, videos, periodicals, and oral histories accessible solely through this database also should provide instructors of GEP courses with new materials with which to design student activities. These materials can easily be incorporated into face-to-face, mixed-mode, and online courses as well. In short, this collection will bolster the relatively few resources on indigenous North Americans currently available in the UCF libraries and expand the types of research both undergraduate and graduate students at all UCF campuses can undertake, regardless of their academic major. goal of supporting the teaching and research mission of UCF and the major goals of President Hitt to provide the best possible undergraduate and graduate education. Faculty members from various departments support this proposal and some of their comments are included here. I unequivocally support the Department of History’s proposal to acquire Indigenous Peoples: North America and make it available to our students. This comprehensive collection fills an important gap which currently exists at the UCF Library. It includes a wide range of sources, including books, newspapers, photographs, and maps from the period. The purchase enables thousands of students engaged in a variety of classes to experience the history and culture of North American indigenous peoples through firsthand accounts. resource to students in the Native American Studies minor. The multidisciplinary classes using oral history components, including military history, social work, and creative writing, will benefit greatly from having access to the oral histories in this collection. I am eager to use these sources in my literature classes, and I heartily recommend that the committee fund this worthy project. articles will provide important firsthand perspectives. Students will utilize census records, legal documents, and cultural sources for their research projects. The span of the collection is impressive, covering well over four hundred years of history. A large number of students in a variety of classes will be able to use these resources, including: Anthropology, sociology, history, political science, pre-law, literature, linguistics, and religious studies. There are many courses in the Anthropology curriculum that will use Indigenous Peoples: North America as an in-class resource and student research tool. useful, as it will help play a large role in the ability of UCF students to more accurately study the possible demographics of their research. The shear variety of the collection enables for students to participate in a higher caliber of research than is currently feasible. The growing trend of digitizing historical documents ensures that this collection will remain a good investment for the university for years to come, and will greatly widen the scope of digital sources already at UCF. Additionally, as a digital collection, it will be easier for professors of survey-courses, such as AMH 2010 and AMH 2020, to introduce students to primary source documents as well as a growing research field which they would be able to participate in. Acquiring this collection would be a source of pride for the university as well as the department, it would further establish UCF as a research institution, and it would enable many students to be able to conduct more in-depth and comprehensive research in Native American studies across many departments. I whole heartedly recommend that the committee fund this project. This is a truly valuable resource, and reliable information about American Indian history and politics are deeply wanting. This information will help provide an important corrective to this, alongside the growing coursework available at UCF. I enthusiastically support the Department of History’s proposal to acquire Indigenous Peoples: North America and make it available to our students. This comprehensive collection fills an important gap which currently exists at the UCF Library. It includes a wide range of sources, including books, newspapers, photographs, and maps from the period. The purchase enables thousands of students engaged in a variety of classes to experience the history and culture of North American indigenous peoples through firsthand accounts. The possible number of students using this database will be substantial. Students in several classes I teach, Ant 3245 Native American Religions, Ant 3312 Ethnography of North American Indians, Ant 3311 Indians of the Southeast. In addition the database will be a valuable resource for students in the Native American studies minor. I am looking forward to using these sources in my class and I heartily recommend that the committee fund this worthy project. a wide variety of subject areas and students. The utilization of these materials in history and anthropology general education courses alone guarantees that this purchase will positively benefit thousands of students. Further, the collection will enhance efforts to increase awareness of Native American Studies, a growing field that deserves greater recognition at this university. Indigenous Peoples: North America is a foundational online resource that will assist UCF Libraries in providing new resources for students engaging in this topic. I fully intend on using the materials in my own teaching and heartily recommend this project for funding. The department of anthropology which has a Native American studies minor, will greatly benefit from having access to this collection. The UCF Libraries will promote the awareness and use of Gale Indigenous Peoples: North America through a variety of channels. The Library will actively collaborate with Dr. Melody Bowden at the Faculty Center for Teaching and Learning to publicize the collections. The focus will be on educating faculty about the importance of these resources and how they can be used for course assignments. The Libraries will distribute informational brochures during various events, such as the faculty development conferences, and will feature information about the collections in newsletters, library blogs, exhibits and special events such as Cram for Exam. Librarians will educate students on the quality, breadth and depth of these collections during Information Literacy sessions. The requested funds ($12,085), in combination with the $2,000 cost share from UCF Libraries, will cover the one-time cost of Indigenous Peoples: North America. These titles are hosted by Gale, so there will be no new demands on UCF staff or infrastructure.